How do you capture wild wolverine footage? How do you capture wild wolverine video? 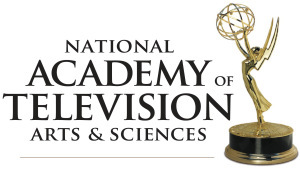 Manske’s wolverine filming expeditions featured on CBC Radio “As It Happens”, with Carol Off. 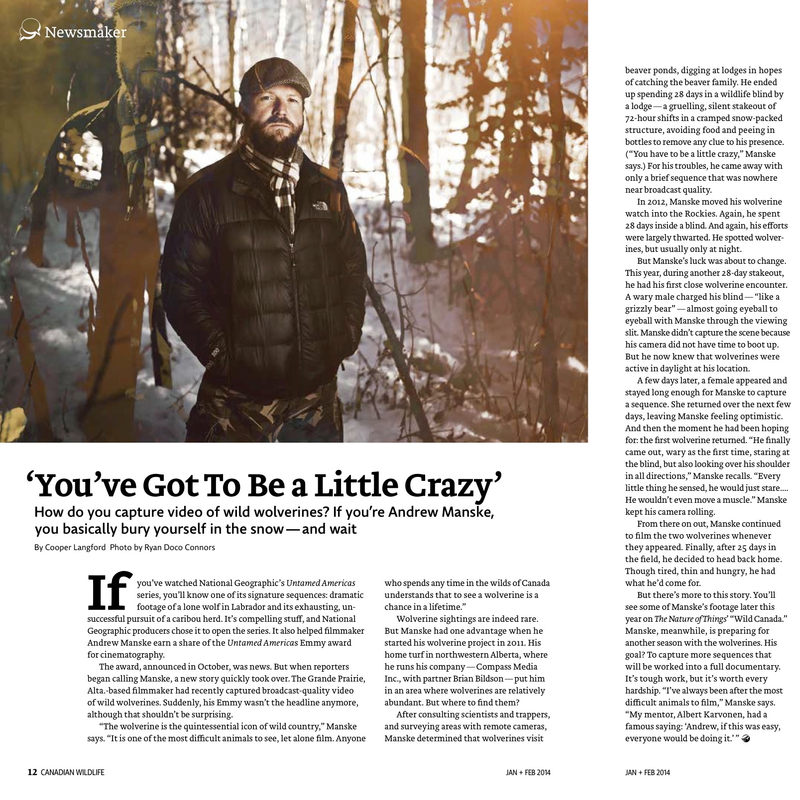 Alberta wildlife videographer Andrew Manske spent three years — often in extreme discomfort — trying to capture the first high-definition video footage of the elusive North American wolverine in the wild.He even bottled his own urine to eliminate the possibility of the animal picking up his scent.Well, his efforts have finally paid off.Click Listen to hear Carol’s interview with Andrew. Manske films endangered woodland caribou for “The Nature of Things with David Suzuki” . 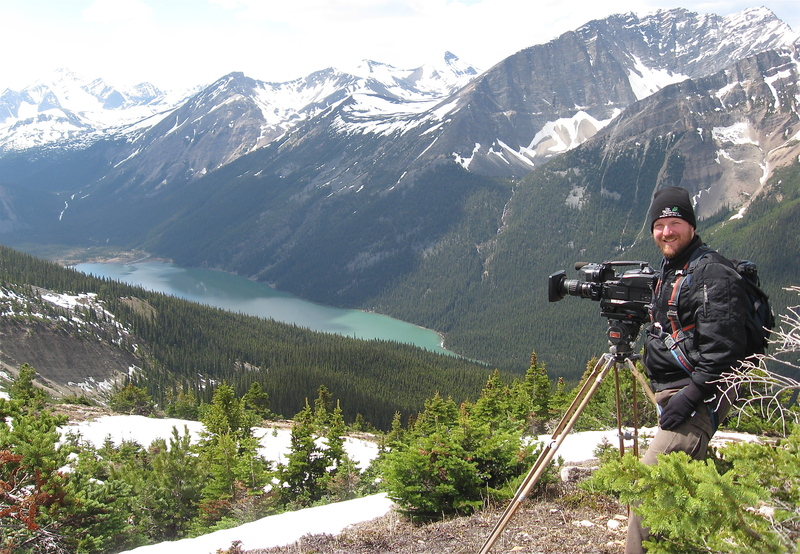 Andrew filming in Willmore Wilderness Park, AB. Prime mountain caribou habitat. Everyone has seen a woodland caribou on a quarter but very few of us have actually ever seen one in the wild. They’re known as the grey ghosts of the boreal forest. They move around in small groups and are notoriously hard to find. It’s even more difficult since their numbers are declining across the country, especially in Alberta, where prime caribou habitat also happens to have prime lumber resources and oil and gas deposits. Learn how researchers are studying how development effects caribou populations. Biologists have been sounding the alarm about the caribou crisis in Alberta for decades. Michael Bloomfield conducted one of the first detailed studies of woodland caribou when he was working as the province’s first caribou specialist in the early 1980s. Alberta’s been documenting their decline ever since. Even in the National Parks they’re in trouble. The remaining caribou in Banff died in an avalanche in 2009. Caribou are indicators of the health of the boreal forest. Canada’s vast boreal forest purifies the air and water and is home to billions of animals. It’s Canada’s largest ecosystem and covers more than half of the country, but only 10% of it is protected. 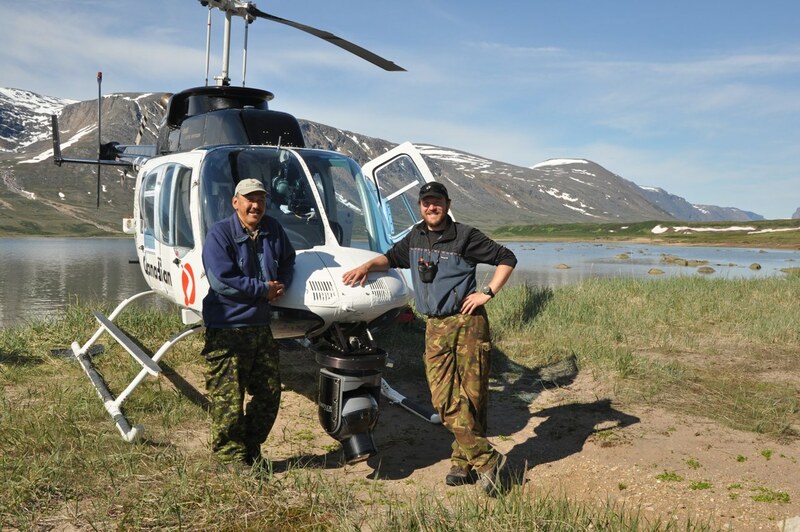 When the forest is fragmented by resource development caribou are vulnerable. The battle over the future of the boreal forest and caribou in Alberta is raising tough questions about the place of wildlife in our world. Big oil wants to expand their operations and they feel that the damage to the landscape they are causing can be mitigated by habitat restoration, and they are proposing ideas like massive fenced in exclosures that would protect caribou, by removing all of the predators, but still allow oil development to continue. Environmental organizations and First Nations argue that too much damage will be done and that land must be set aside for caribou. The Athabasca Chipewyan First Nation has produced their own stewardship strategy to protect caribou habitat and their way of life, but industry and government seem uninterested. See which parts of Canada can support self-sustaining caribou populations. The most critically disturbed caribou habitat in Canada is the Little Smoky range north east of Jasper National Park. Only 5% of intact forest remains. Trapper Ken Cowles has a cabin in the middle of it. He used to see caribou all the time and now they’re gone because the gas companies are moving in. The Alberta government has been killing an average of 100 wolves a year for 8 years to protect the caribou in Little Smoky, but they are still selling oil and gas leases in the caribou range. On October 5, 2012 the Federal Government released a recovery strategy for boreal caribou that is designed to ensure that Canada has self-sustaining boreal caribou populations from coast to coast. The Minister of the Environment, Peter Kent, is confident that Alberta has both the intention and the capacity to meet its obligations to the recovery strategy. Trapper Ken Cowles is not so sure. We still have time to ensure that Alberta’s woodland caribou don’t disappear and we have the laws to protect them, but will we?